And received the immaterial and noetic. 1. At this same time there lived a certain Publios,1 who was both good-looking in physique and possessed a soul that matched his physique, or rather displayed one far more wondrous than his body. He originated from the curial order, while his city was where the celebrated Xerxes, marching against Greece and eager to cross the river Euphrates with his army, assembled a large number of ships, yoked them to each other and in this way bridged the river; he called the place Zeugma, giving it a name from the event. Originating from here and stemming from such a family, he repaired to a high place not more than thirty stades distant from the town. Here he built a small hut and gave away everything he had inherited from his father - I mean home, property, herds, clothing, vessels of silver and bronze, and anything else that went with them. 2. After distributing these, according to divine law, to those who needed them, and freeing himself from every worldly care, he took on one care to replace them all, the service of the One who had called him, and turning this over in his soul, continued night and day considering and examining how to increase it. For this reason his toil increased continually and was intensified each day; yet it was sweet and full of pleasure, driving satiety far away. 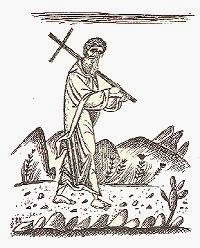 For no one ever saw him taking a rest for even a small part of the day, but psalmody was succeeded by prayer, prayer by psalmody, and both by the reading of the divine oracles; then came attending to visitors, and then some other of the necessary tasks. 3. Spending his life in these pursuits, and exposed as a model of virtue for those who wished to emulate him, like some singing bird he drew many of his fellows into this trap of salvation. At the beginning, however, he would not have anyone to live with him; building small adjacent cells, he ordered each of those who assembled to live separately, while he continually inspected and examined the cells to prevent their containing something stored away in excess of need. They say that he even carried scales with which to examine closely the weight of the bread, and that if he found more than had been laid down, he was angry and called those who did this gluttons. He ordered them to expect satiety in neither their eating nor their drinking, but to take that quantity which was sufficient to assure life to the body, and if ever he saw meal separated from bran, he would rail at those who had done this for feeding on sybaritic fare. At night he would come to each door suddenly, and if he found someone awake and hymning God, he would depart again in silence; but if he perceived someone fast asleep, he would knock on the door with his hand and rebuke the sleeper with his tongue for giving the body more than it needed. 6. This form of life has continued even till today: neither time, which is eager to change things of this kind, nor those who inherited this man's charge have been induced to change anything of the rules he laid down, and this although not two or three but many have become superior. As soon as he had completed his contest and departed from this life and crossed to that life without sorrow, Theoteknos became superior over the Greek-speakers and Aphthonios over the Syriac-speakers, both of whom were living statues and images of his virtue. They prevented both their brethren and visitors from outside from being aware of his death by making themselves impressed of his mode of life. But the divine Theoteknos lived on only a short time and passed on the post of superior to Theodotos; Aphthonios continued for a long period to look after the flock and direct it according to the rules in force. 7. This Theodotos, originating from Armenia, beheld this ascetic company and was at first enrolled among the subjects, obeying the government of the great Theoteknos. When, as I said, the latter made his departure, he received the leadership, and abounded in such good qualities as almost to obscure the fame of his predecessors; for divine longing so worked on him, and wounded him with darts so great in kind and number, that night and day he poured forth tears of compunction. He was full of such spiritual grace that when he prayed all those present simply listened in silence to his sacred words, thinking the listening to be an earnest prayer. For who, while these words were being offered so sincerely, was so made of steel as not to be bewitched in soul and to make soft what was hard and unyielding in it and transfer this to the service of God? Thus increasing his wealth each day and making his inviolate treasury full of such good things, after shepherding the sheep for twenty-five years, he was gathered to his fathers, reared to a fine old age, in the words of divine Scripture, and handed over the reins to Theoteknos, his nephew in birth and brother in character. 8. That divine Aphthonios, after presiding over the choir for more than forty years, received the episcopal see, but without changing either his rough ascetic cloak or his tunic made from goat's hair; and he ate the same food as before his episcopate. Despite taking on this charge he did not tend that flock any less, but spent most of his days there, now resolving the strife of those quarreling, now exercising care of those wronged by anyone, at other times addressing exhortation to his disciples; and he performed each of these tasks while, in between, stitching the rags of his companions or cleaning lentils or washing grain or doing something else of the kind. After having thereby adorned his episcopate and increased his virtue, he repaired with this cargo to the divine harbor. 9. And what should one say about Theoteknos and his successor Gregory? The former acquired in his youth every form of philosophy and departed with the fame of his predecessor, while the latter still labors in profound old age as in a body in full vigor, for he has persevered in entirely refusing the fruit of the vine and not even taking vinegar or raisins, nor milk whether freshly drawn or curdled - for this mode of life was laid down by the great Publios. As for oil, they share in using it during the season of Easter, but refuse a share of it afterwards. 10. Such is what I have learnt of the great Publios - of which some came to me by hearsay, and some by my seeing his disciples, recognizing the teacher in his disciples and discovering the trainer through his athletes. Therefore, thinking it unjust, even malicious, to leave something so beneficial in silence, I have set out this narrative for those who do not know it, gaining for them its benefit and procuring for myself the profit that comes from recalling it. For I have attended to the saying of the Lord, 'Everyone who acknowledges me before men I too shall acknowledge before my Father who is in heaven.' And I know clearly that, through communicating to mankind the memory of these men, I shall enjoy being remembered by them in the presence of the God of the universe. 1. Publios (Publius) was a monk and monastic founder three miles outside Zeugma in Euphratensis. He is listed in Theodoret, Eccl. Hist. IV.28 among the monks of around the time of Valens (364-378), and is here described as Eusebius's contemporary. His immediate successor Aphthonios, who was abbot for 'more than forty years', received letters from John Chrysostom in 406. This all suggests that Publios founded his monastery c. 350. 2. For this theme of the coenobitic life's enabling mutual assistance, see St Basil, Longer Rules 7. 3· Cp. the funeral of St Paula (in 404), where psalms were chanted in Greek Syriac, and Latin (Jerome, ep. 108.29). That Greek was the language of Publios's first disciples, as well as his own curial origins, shows that monasticism originated here among the educated, Hellenized class. From The History of the Monks of Syria.